JOHNSON, WILLIAM ARTHUR, Church of England clergyman, biologist, and educator; b. 10 March 1816 at or near Bombay, India, the second son of Lieutenant-Colonel John Johnson and Dederika Memlingh; m. in the parish of Dunn, Upper Canada, 13 Dec. 1836, Laura Eliza Jukes; d. in Yorkville (now in Toronto, Ont. ), 29 Dec. 1880. Colonel Johnson retired from active service in 1819. His son William Arthur was educated at Addiscombe Military College at Croydon, near London, England. He was destined for the army, but abandoned that career, and in 1835 migrated with his father to Upper Canada to a settlement being formed near Port Maitland. In his early twenties William Johnson became aware of the pressing need for Church of England clergymen in the colony. In 1848, when he was living in Yorkville, he was interviewed by Bishop John Strachan*. Strachan considered him “a very fine lad,” and encouraged him to attend the Diocesan Theological Institution at Cobourg where A. N. Bethune was principal. Johnson did so, was ordained deacon on 26 Oct. 1851, and admitted to the priesthood on 10 Oct. 1852. Meanwhile, in 1848, Dr James Bovell had arrived in Toronto from the West Indies to practise medicine. Possibly he and Johnson had previously known each other for on 3 Sept. 1848 Bovell stood godfather to Johnson’s second son, Arthur Jukes, and his third son was named James Bovell. Both men were skilled in the use of the microscope, and had similar interests, including religion; their close friendship continued for the rest of their lives. After his ordination as deacon Johnson was appointed officiating minister at Scarborough. The next year he was sent to Cobourg, and remained there until March 1855. Returning to Yorkville, he assisted the minister of St Paul’s, John George Delhoste MacKenzie, and agreed to act as assistant minister for one year. His appointment as minister of St Paul’s was discussed but a few members of the congregation threatened to leave if Johnson was retained. 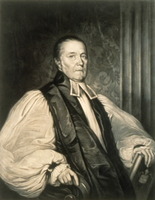 An appeal was made to Bishop Strachan, who recommended that Johnson withdraw and appointed him incumbent of Weston. Johnson’s removal to the village of Weston might be considered a demotion, but it afforded him scope to develop the talents by which he is chiefly remembered: the founding in 1865 of a well-known Canadian residential school, Trinity College School; and the guiding of one of its pupils, William (later Sir William) Osler*, into the field of scientific research. In the early 1860s Johnson, with three sons to educate, started a small school for boys in Weston, at his own expense. In 1864 he proposed that it be placed under the control of the University of Trinity College and be known as the Trinity College School. Trinity agreed, appointed a headmaster, Charles Howard Badgley, and left Johnson to be responsible for the finances. The school, opened in May 1865 with nine pupils, was modelled on an English public school: the main subjects were classics and mathematics, and prefects were appointed from among the senior boys. Johnson taught French, drawing, and painting, without remuneration. The most popular sport was cricket. Johnson’s connection with the school was brief, ending in 1868 when the school was moved to Port Hope. The number on the roll from 1865 to 1869 was 131. The medical director of the school was Bovell, and he and Johnson, usually accompanied by William Osler who was one of the prefects, spent parts of many weekends at Weston collecting and mounting specimens for microscopic study. Throughout his life, Osler acknowledged that a large part of his success was due to the influence and friendship of Bovell and Johnson. Both Johnson’s parents were artists of some note, and his inheritance of their artistic ability may be seen from his paintings, sketches, and wood-carving. A cabinet, Johnson’s handiwork, containing a large number of his slides, is on view in the Academy of Medicine in Toronto. PAO, Strachan letter books, 1844–49, 8316. Anglican Church of Canada, Toronto Diocesan Archives, W. A. Johnson file, W. A. Johnson to Bishop Arthur Sweatman, 6 June 1879. Trinity College Archives (Toronto), Corporation minutes, 1850–68, 40, 52, 83, 324, 338–39. A narrative of certain circumstances which took place at St Paul’s Church, Yorkville; to which are appended all the correspondence and papers, which came to hand during the unhappy discussion (Toronto, 1856). University of Trinity College, Toronto, Calendar, 1865–68. Canadian Churchman (Toronto), 14 Oct. 1852. Church (Toronto), 30 Oct. 1851. Harvey Cushing, The life of Sir William Osler (2v., Oxford, 1925). F. K. Dalton, “The Reverend William Arthur Johnson, clergyman, artist, architect, scientist, teacher, 1816–1880,” Can. Church Hist. Soc. J. (Toronto), VIII (1966), 2–15. C. E. Dolman, “The Reverend James Bovell, M.D., 1817–1880,” in Pioneers of Canadian science, ed. G. F. G. Stanley (Royal Society of Canada “Studia Varia” series, IX, Toronto, 1966), 81–100. J. B. Elliot, “The Johnson cabinets in the Osler collection at the Academy of Medicine,” and N. B. Gwyn, “The early life of Sir William Osler,” in International Association of Medical Museums, Bulletin IX, and Journal of Technical Methods (Montreal, 1926), 465–69, 109–49. [A. J. Johnson], “T.C.S. history, reminiscences of Dr A. Jukes Johnson (1865),” Trinity College School Record (Port Hope, Ont. ), XLIII (1940), 45–50. George W. Spragge, “JOHNSON, WILLIAM ARTHUR,” in Dictionary of Canadian Biography, vol. 10, University of Toronto/Université Laval, 2003–, accessed April 24, 2019, http://www.biographi.ca/en/bio/johnson_william_arthur_10E.html.